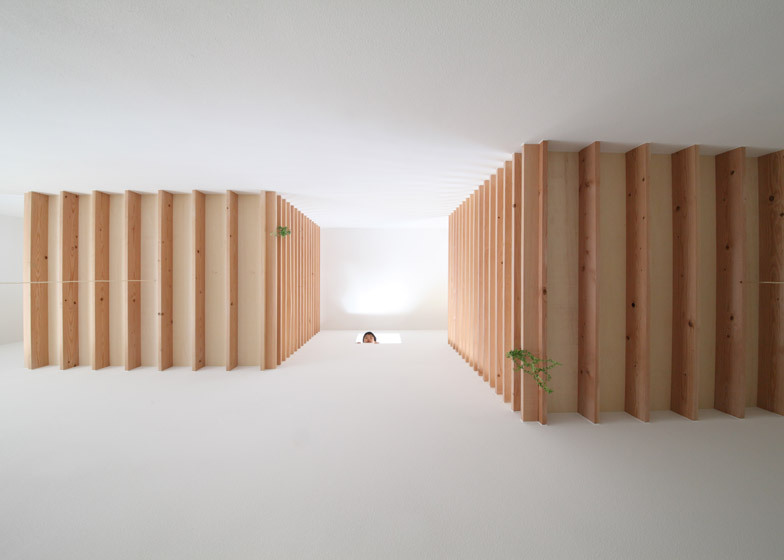 A corridor functions as an indoor garden for this small house in Toyota, Japan, above which architect Katsutoshi Sasaki has installed a series of wooden sleeping platforms. The need for natural lighting drove the design of House in Yamanote. Located in an area just outside the city centre, the building sits in the shadow of a six-storey apartment block to the south. This prompted Katsutoshi Sasaki – whose past projects include a three-metre-wide house – to plan the building around a double-height corridor, with the intention of bringing light into every room from the north side of the site. "When I came for the first time to this project site, the whole site was covered in shade," he said. "I proposed a project with a relationship to natural light, despite being in a shadowy place." "The north side of the site is hardly affected by the shadow from the apartment block. So I planned the space that would receive light from the north side." Filled with pot plants, the generous corridor stretches west to east along the northern side of the building. Unlike the rest of the house, which has wooden floors, its surface is concrete. Sasaki describes it as a dirt floor. At the far end, a staircase creates a route up alongside the space. The wooden stairs are sandwiched between two walls, and each tread features several narrow openings to allow light to filter through. A series of landings break the staircase into different stages, and each one leads through a different sleeping platform suspended above the corridor. There are three in total, all at different heights. Horizontal lengths of wood provide see-through partitions on both sides of each platform, so residents can look across them, and also see through to the floor below. 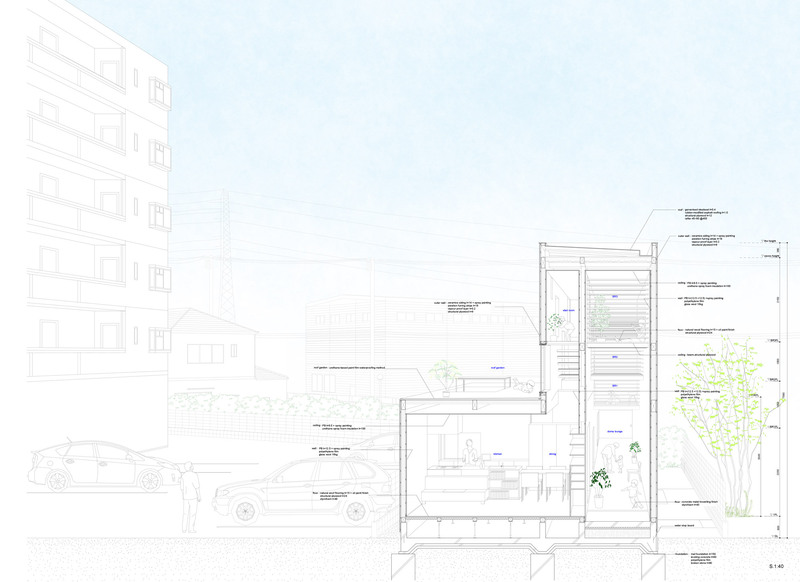 The rest of the 110-square-metre house is single storey, so Sasaki could add windows on the southern wall of the double-height volume to bring light into the space from above. "This light-receiving volume catches the strong sunlight from the south in the stairs space, and sends soft light to rooms through there," said the architect. "The light adopted by many windows creates a variety of internal scenery with synergy." The rest of the house is divided into three zones. A master bedroom occupies the western end, while the eastern end accommodates a combined living, dining, kitchen and study space. Bathrooms and utility rooms are slotted in between. A small patio with a skylight overhead is located on the south side of the plan. There is also a terrace on the lower section of the roof. Sasaki established his architecture studio in 2008. Other projects by the office include a triangular house poking out of the ground in Gifu and a four-winged house, also in Toyota. Photography is by Katsutoshi Sasaki + Associates.